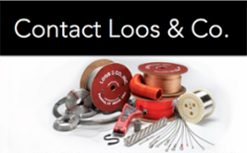 KobraKoils - Loos & Co., Inc.
Loos and Company proudly offers KobraKoils® as part of its diverse product lineup. 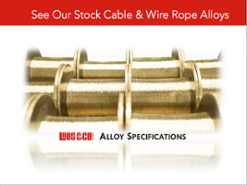 KobraKoils® are coiled steel cables that at quick glance resemble a spring. The defining trait of the KobraKoil® is its rebound memory - it can be stretched out of its shape, and once tension is relaxed, it returns to its original form. KobraKoils® can be made from jacketed or bare cable, made in any color or any length, and can have any hardware attached to its ends. 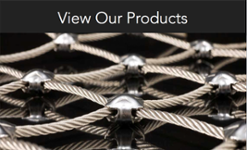 KobraKoils® have found success in many applications including bicycle locks, tool balancers, dog leashes, trailer safety cables, restraint cables, and retractable tie down cables. Loos and Company is pleased to offer KobraKoils® as part of our family of products. For more information or to place an order for KobraKoils® please contact us. Below is a table listing the types of KobraKoils® that are available. 1/16" 3/32", 1/8" 7 x 7 2"
3/32" 1/8", 5/32", 3/16", 1/4" 7x 7, 7 x19 2"
1/8" 5/32", 3/16", 1/4" 2"
5/32" 7/32", 3/16", 1/4" 2"
3/16" 1/4", 5/16", 3/8" 2.5"
7/32" 1/4", 5/16", 3/8" 2.5"